One of the perks of studying French at college was that I actually had to study abroad in France and for me that meant the university quarter in Paris. In lectures on the rise of post modernism, formalist analysis of Baudelaire and trips to every art museum the city had to offer, I also found time to indulge in all the delicious food. This meant daily outings to the nearby Monoprix to pick up the nouveau Beaujolais, bread (une baguette, s’il vous plaît) and cheese or grabbing whatever was on offer in the many restaurants. The French do many things well when it comes to food, but they are not particularly creative when it comes to sandwich making. You likely won’t find new and innovative ingredients between 2 pieces of bread but you will find quality. The bread is crunchy on the outside but soft inside. The cheese is the best you’ve ever eaten. The slices of ham or saucisson are salty and powerful. One slice is all you need in your sandwich along with the butter – French butter, that is. The butter that makes EVERYTHING heavenly. When it comes to making French food, great care and attention should be paid not only to technique but also to the quality of ingredients. It simply won’t taste as good if you use sub par stuff. So, my advice for this recipe is to do the best you can. You don’t have to use the traditional ingredients if you can’t find quality. So, if you can’t find good Gruyere simply substitute it with another hard cheese that is high quality. If you can’t get good French ham slices but you can get good Prociutto or Serrano ham, then try using that. Don’t use normal sandwich bread either. Go to the bakery and pick out a nice crusty loaf. Take great care with this sandwich and you’ll taste the rewards. Bon Appétit! Once butter is clarified, stir in 1 tbsp of flour along with a pinch of nutmeg and whisk together. Let cook on medium low heat for 1-2 minutes. You want the roux (flour and butter mixture) to cook but not to brown. Once all milk has been poured in, increase heat and continue to whisk until boiling. Once at a boil, reduce heat to low and continue to cook for 2-3 minutes stirring occasionally. Season with salt and pepper to taste. If you prefer not to have black specks in your sauce, simple use white pepper instead. Spread 1-2 tbsp of béchamel sauce on each slice of bread. Top with 1-2 slices of good quality ham. Combine pieces of bread together so that you have a béchamel and ham sandwich. Spread mustard on the top of sandwich. Spread 1-2 tbsp of béchamel sauce over mustard. Top with 2-3 oz of grated cheese. Place on a baking tray beneath the broiler or grill and cook until cheese is melted, bubbly and slightly browned. Serve with a side salad, frites (french fries) and a spoonful of dijon on the side. Enjoy! Once butter is clarified, stir in 1 tbsp of flour along with a pinch of nutmeg and whisk together. Let cook on medium low heat for 1-2 minutes. You want the roux (flour and butter mixture) to cook but not to brown. Slowly add the warm milk a little at a time, whisking it together as you go. Once all milk has been poured in, increase heat and continue to whisk until boiling. Once at a boil, reduce heat to low and continue to cook for 2-3 minutes stirring occasionally. Season with salt and pepper to taste. If you prefer not to have black specks in your sauce, simple use white pepper instead. Remove from heat after 2-3 minutes. Invest in good quality bread, cheese and ham. Combine pieces of bread together so that you have a béchamel and ham sandwich. Spread mustard on the top of sandwich. 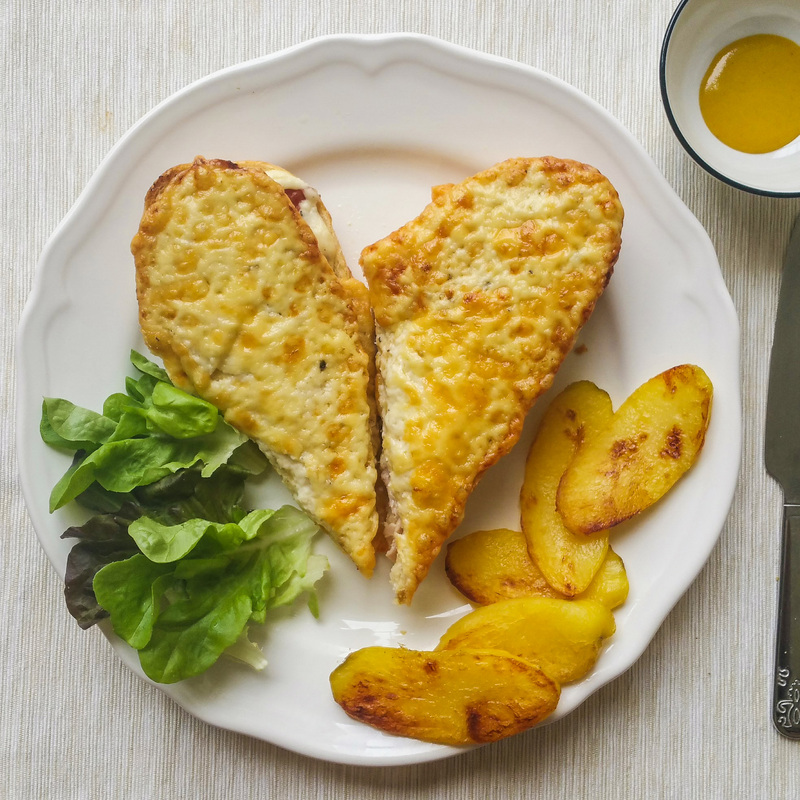 Turn any croque monsieur into a croque madame by topping with sunny side egg.